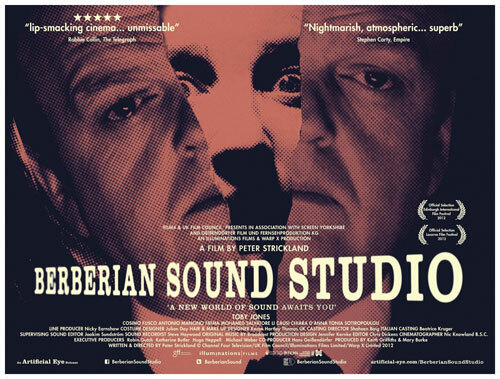 Just managed to catch the last showing of Peter Strickland‘s excellent new film Berberian Sound Studio at the Rex in Wareham, an original cinema staffed by volunteers with red velvet curtains and a cosy bar – the perfect place to see such a retro film. Here’s an interview with Broadcast’s James Cargill who did much of the soundtrack (plus a great mix if some his top Italian film music) along with the late Trish Keenan, and here is a fascinating selection of some of Peter Strickland’s favourite film soundtracks. Berberian Sound Studio itself is a must for any lover of analogue sound equipment, lovingly rendered in warm colours and the claustrophobic atmosphere of the studio itself, where melons are mashed, radishes ripped and moustachioed goblins and virginal maidens scream and skrike onto the sound track of an unseen Italian horror flick, or giallo, with shy, retiring and much put-upon sound engineer Gilderoy at the controls. The opening sequence (by Ghost Box/the Focus Group’s Julian House) of the film-within-a-film, The Equestrian Vortex is stunning, all blood-reds and Satanic blacks. You are definitely glad you don’t see any of the unspeakable horrors onscreen. The ending to me seemed slightly unsatisfying, but actually completely in keeping with that era of film, where it all goes a bit mystical and fades to white without any real explanation – a bit like 2001 A Space Odyssey. That said I’ll definitely watch it again. Check out how Mitt Romney proposes to cut US taxes by $5 trillion.